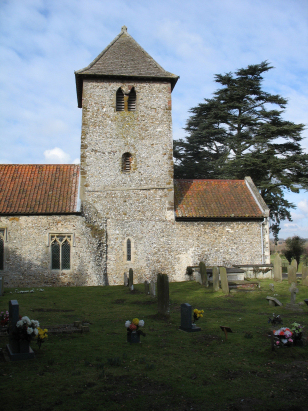 The parish of Newton, which as its suffix suggests is close to the large village of Castle Acre, lies in the western portion of central Norfolk. Newton is a tiny hamlet consisting of little more than the church, an inn and a couple of farms sitting on the A1065 road about 4 miles north of the market town of Swaffham. Newton is a largely agricultural community sitting on the southern banks of the River Nar which forms the boundary with its larger neighbour Castle Acre. The hamlet sits in the noticeable gap which the Nar has cut through the western chalky hills of the area. The rather poor and shallow soils would, prior to the introduction of modern machinery, have led to pastoral farming being the dominant employment with sheep and warrenries prominent. All Saints' church sits on the western side of the A1065 opposite the junction with the lane that runs eastwards to Great Dunham. 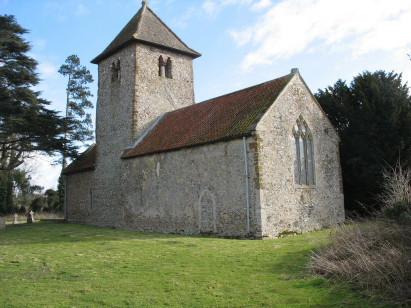 The church is one of the oldest in Norfolk and Pevsner confidently dates the majority of the structure as Saxon. The church follows an unusual layout with its central tower, which is also unusual as such ancient towers are traditionally round. The nave has a few Decorated windows which are probably modifications to the originals and the chancel shows signs of remodeling in the typical church-building era of the 14th century but largely the church seems almost intact and of the pre-Norman period. A single standard 800-entry register book covers the period of this transcript and indeed runs onwards to completion at the end of the 20th century. This register is filmed on Microfilm MF1622 in the collection of Norfolk Record Office which was used to prepare this transcript. The film is a recent one, as befits a relatively recent deposit, and benefits greatly from the improved modern techniques. The register is rather erratic clerically with some date details missing and also marginal entries inserted as omitted from the proper place. These clerical asides the piece was relatively straightforward to prepare.